ProMation Engineering P2-13 Series Quarter-Turn Electric, Non-Spring Return Actuators feature a rugged, industrial grade design for use with all ball and butterfly valves or dampers requiring higher torque outputs from 800 in lbs. to 40,000 in lbs. The series features a self-locking hardened steel drive train for smooth operation, mechanical end of travel stops, and patented clutch-free manual override for single-handed positioning of the actuator in any situation. The P2-13 actuators include an integrated position indicator, two auxiliary switches, an internal low-power anti-condensation heater, and cast aluminum polymer coated housing with two 3/4" conduit connections that are rated NEMA 4X for safe exposure to high pressure hosing and corrosion resistance. Proportional control units accept a wide range of control signals while generating multiple feedback signals and are easily installed, calibrated, and adjusted in the field. 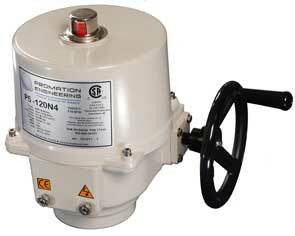 The actuators are available for 24 VAC/VDC, 120/230 VAC or single phase and complete 3-Phase offerings. They are ISO 5211 compliant, conform to AWWA C540 standards, are certified to CSA 22.2 standards including ANSI/UL 50 and ANSI/UL 429, and are ARRA compliant. For more information, call 352-544-8436, Fax: 352-544-8439, E-mail: info@promationei.com, browse this site, or write ProMation Engineering, 16138 Flight Path Drive, Brooksville, FL 34604.